Central Asian Shepherd Dog is a protective dog who bonds first to its human caretaker and next with its perceived possessions. Bred to solve problems, it is independent minded, strong, brave and responsible. It is a large but agile dog, sometimes described as a cat in dog’s clothing. With its strong guarding and territorial instincts, it is not a breed for the novice owner. Sensitive and smart, the Central Asian Shepherd responds best to someone who can inspire loyalty while also providing strong leadership. Heavy-handed training will backfire with this breed; but respectful, thoughtful training will yield an undying devoted companion. The large Central Asian Shepherd Dog may spend a considerable amount of time moving around in its native lands, and this kind of slow but steady exercise is what it likes best. With a job to do and a piece of property to protect, it will find the highest spot and keep an eye on all that happens. The Central Asian is a working breed of dog, and different breed fanciers organizations issue sets or rules and recommendations important to preserve dogs’ abilities to perform certain duties. This includes special tests to determine a dog’s inborn qualities, and training degrees or titles aimed to show what the dog can learn to do. The National Breed Club in Russia developed a temperament test to reveal a dog’s willingness and ability to protect the premises, as well as titles in Obedience (such as OKD), and in Protection (such as ZKS or KS) for dogs in most pedigrees from Russia and other countries of that region. There are several other types of tests and training titles, from simple to extremely complicated. 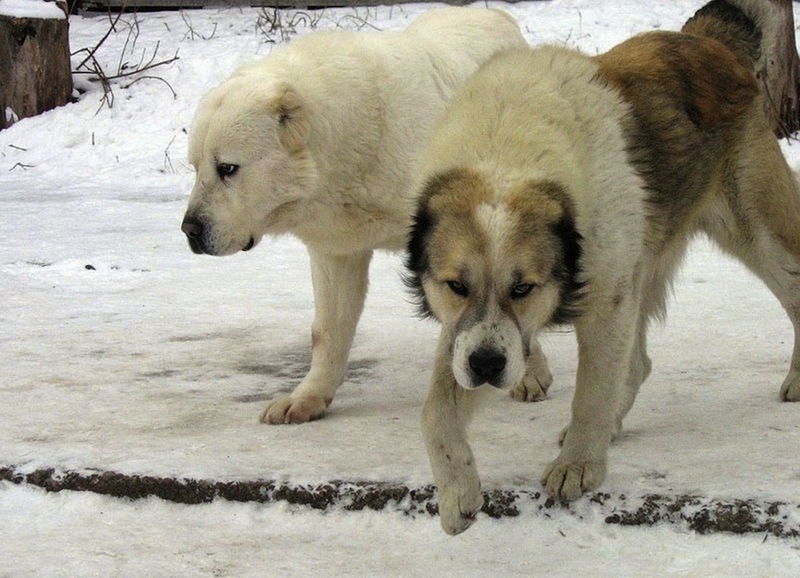 Breed Clubs in European countries seldom have requirements, while common dog sports such as Schutzhund or IPO are not perfectly suitable for a Livestock Guardian dog. Some European Union Countries developed special tests for large breeds of dogs aiming to reveal a dog’s overall stability, such as The Mentality Assessment test in Sweden. Central Asian Shepherd Dog breed presents a robust dog of greater than average size with great strength and power. They are independent, curious and alert, yet imperturbable. The dog is as long as it is tall at the withers, or slightly longer than its height. The hair is short or moderately long with a heavy undercoat. Its ears are, in practice, cropped very short, and the tail is docked moderately long (except for dogs from countries where cosmetic surgeries for dogs are illegal). Most common colors are black/white; fawn of different shades, from almost white to deep red; brindle. Some have a black mask. The head is very solid, without pronounced stop or sculls. The neck is low set, short, with dewlap. The body is fairly broad, proportionate, muscles rather flat. The ribcage appears very long because of developed false ribs. The legs are straight, with heavy boning and moderate yet defined angulation. Leg bones must be in proportion, and shall never give the impression that any bone is short. The rump is broad. The typical gait is a gallop; however CAO can trot for hours without wearing themselves out. Share your Central Asian Shepherd Dog story. Note: Upload only Central Asian Shepherd Dog picture or your picture with Central Asian Shepherd Dog below - spammer's ip may be blocked. What an amazing article! We’re Central Asian Shepherd breeders/trainers. The Central Asian Shepherd is a loyal, beautiful dog that responds exceptionally well to loving and thoughtful training. i will be scared for life!!!!! what if my children see this???? ?